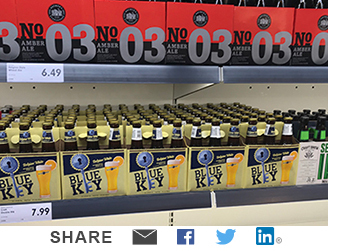 Late last year, we toured an impressive new Lidl store in Virginia and headed straight for the beer aisle to see how this fast growing retail chain was executing in the category. This being Lidl, the shelves were stocked with only the high velocity SKUs of the Bud, Miller and Coors portfolios with Angry Orchard, Corona, Heineken and Smirnoff Ice thrown in for good measure. The shelves and displays were clean, well-stocked and smartly labeled. Lidl certainly delivered on its proposition. But within the forest of a very standard shelf set, we also saw private label brands we'd never seen before and they represented significant shelf space. We saw a European-looking Hefeweizen called Perlenbacher, a Belgian White called Blue Key, a craft brand called No 03 Amber Ale and two American light lagers called Boss Light and Sprint Light. It wasn't hard to find the original inspiration for any of these Lidl-only brands. If you grow up watching Wile E Coyote try and fail to catch the Road Runner with Acme products over and over again, it's tough to have a favorable 'first impression' of private label. Americans don't have the same positive relationship with store brands that Europeans do, and probably never will. Furthermore, beer is a category with overwhelming choice at every price point, so the private label threat has always been meager at best. So in that 'first impression' moment at Lidl, the overall beer execution looked good, but it was easy to be dismissive of the private label brands on display. Our first impression, however, may have been a bit misguided. This year, the New York International Beer Competition anointed Lidl the 2018 Beer Supermarket of the Year. On top of that, Lidl pulled in eleven medals for its beers at the competition. Lidl's Belgian Style Tripel, Bronzen Schild, won double gold and Perlenbacker German Hefeweizen wheat beer won gold. Lidl's Brewer's Storehouse No. 3 Amber Ale, which we saw on the shelf as a nearly anonymous looking me-too brand, won Amber Ale of the Year. In addition to those big wins, Lidl scored an extra five silver and three bronze medals for other of its products. These awards come in an environment where many of the industry's key brands and categories are being commoditized, which should theoretically make them vulnerable to private label. Given Lidl's relative success in private label beer, the question we had is this: is Lidl simply a great one-off for private label beer retailing or a canary-in-the-coal-mine for piling on more pressure to the big brewers? There's always a danger of taking an anecdote and making it a trend so we dug more deeply into the numbers. When we started looking at our own hard research more closely, the private label beer potential (or threat) was not nearly as promising (or threatening) as Lidl's execution on its store brands might suggest. First, beer as a category is moving upscale and consumers are paying up for craft and imports, a trend that has been around a long time. Second, value beer, the segment most likely to be vulnerable to a private label market share smash and grab, is effectively in free fall. So taken together, this is certainly not an environment ripe for beer brands with low recognition or price as a primary driver of consumer choice. The numbers in our proprietary DrinkTell™ database bear this out. The overall beer industry grew at a CAGR of only +0.2% for 2011 to 2017. However, the branded, high-end segments of the beer industry are thriving. During that 2011-17 period, imports grew at a CAGR of +4.2%, craft beer at +10.1% and super-premium regular at +2.9%. In comparison, value regular beers sunk at a CAGR of -2.9%. It's tough to make a compelling case for private label against those trends. "Multiple factors contribute to alcohol's limited private label presence. For starters, the alcohol industry has a relatively complex three-tier structure and wildly irregular state laws. Retailers with an interest in private label have moved toward easier categories to navigate. Less than half the states allow supermarkets to sell liquor, and in fewer than 20 states do existing rules make it practical for stores to do so. Even in those states, there are strict rules which govern licensing, hours of sales and other in-store activities." So give credit to Lidl, the undisputed king of what will likely only be a tiny kingdom. Time will tell.